The decline of bird species in a wide range of North American habitats -- forests, prairies, shrublands, mountain regions, marshes, and deserts -- has inspired two decades of intense scientific study of bird ecology and conservation. But for professional scientists and amateur birders alike, interpreting the results of these diverse studies is often complex and bewildering. 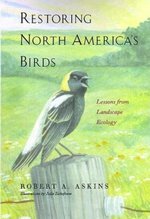 This accessible book pulls together recent research on bird species and habitats to show how basic ecological principles apply in seemingly different situations. Robert A. Askins provides an engaging introduction to bird ecology and concepts of landscape ecology, focusing on such intriguing species as Bachman's Warbler, Red Crossbill, Mountain Plover, and Marbled Murrelet. Understanding the ancient landscapes of North America and how humans have changed them, Askins says, is essential for devising plans to protect and restore bird populations. In addition to such obvious changes to the landscape as the clearing of forests and plowing of prairies, more subtle changes also dramatically affect birds. Species may disappear when we interrupt natural disturbances by suppressing wildfires or trapping out beaver, or when we disrupt habitat with roads and housing developments. Askins challenges some of the assumptions that underlie current conservation efforts and offers concrete recommendations, based on sound ecological principles, for protecting the rich natural diversity of North America's birds.